Kex Rx is your family of hometown pharmacies offering surprisingly low prices! We promise to provide caring service and a full-range of support to help you and your family save money and be as healthy as possible. A positive relationship with your pharmacist will help improve your and your family’s health. Supporting a local business keeps your money in your community and improves the local economy. Kex Rx is owned and managed by Joe Koechner. Joe grew up in the rural farming community of Tipton, Missouri. 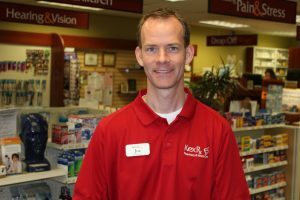 He attended Benedictine College and graduated in 1996 from the University of Missouri-Kansas City with a Bachelor of Science in Pharmacy.